If you would like to read first four parts of this series you can access them here: Bamboozled Believers’ Big Bible Blunders [Part 1of 5], Our “Last Days” Blunder [Part 2 of 5], Our “New Heaven and New Earth” Blunder [Part 3 of 5], Our “Judgment Day” Blunder [Part 4 of 5]. Did Jesus mock the suffering of those persecuted saints by writing a book filled with dark imagery, describing events that would not happen until thousands of years later? Or, did he write using imagery that those people understood to describe terrible events that were about to happen 2,000 years ago? And if he was describing the distant future, why would he lie by telling them that it deals with events that were about to happen? God says that he cannot lie… but maybe he was lying when he said that he does not lie! Words have meaning and God knows the meaning of the words that he uses… why don’t we accept Jesus’ words: “I am coming soon!” Apparently our modern day Pharisees believe that Jesus was lying! How else do we explain the way that these sanctimonious, blind leaders of the blind interpret the book that is a “revelation of things that were about to happen”? With devious intellectual contortions they dismiss Jesus’ clear statements. But his disciples understood what Jesus meant because in many New Testament passages they express their eager anticipation of his imminent return. For example in John 21:23 we see that the disciples expected that John would be one of the ones who would live to see Jesus’ return. Obviously they expected Jesus to return soon. When the enemies of the faith say that Christianity is a false religion because Jesus didn’t return as he promised, our bamboozled futurist brothers have no answer. But there is an easy answer to the problem of non-occurrence. The answer is “OCCURRENCE”! Instead of forcing futurist fantasies into the text, why not accept what the Bible says? Accepting the fact that Jesus returned, as predicted, almost 2,000 years ago changes nothing about our blessed hope of spending eternity with our risen Lord. But it means that we must overcome our pride and admit that we have been bamboozled by an enormous delusion… We have been using prophecies that were fulfilled long ago to predict our future! Over and over, year after year, decade after decade and century after century, our doomsday prophets and Chicken Little preachers have been WRONG! WRONG! And WRONG again! 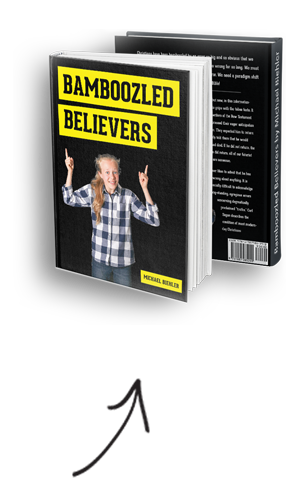 It is time to admit our error… Please read Bamboozled Believers and then join in the battle for truth… the truth will revive your interest in real Bible study and as more and more of us learn the truth, the truth will spark a revival in the church!